Still, Leggio, 31, can’t find work. Just three weeks before NHL training camps open, he hasn’t secured a contract for 2015-16. He has, however, accepted a tryout invitation to the Winnipeg Jets camp. Leggio feels he’ll “be better off” for the experience. But right now, the process isn’t fun. He’s open to returning to Europe, where he won a championship in 2009-10 in Finland. Leggio won’t make excuses for his poor play – “They were horrible numbers,” he said – with Bridgeport, the New York Islanders’ top affiliate. What happened last season? How did the same goalie who had a .924 save percentage in 64 games in 2012-13 and who had never compiled a goals-against average above 2.80 fall apart? “Honestly, the bottom line is there were some games I got scored on a lot of times,” he said. 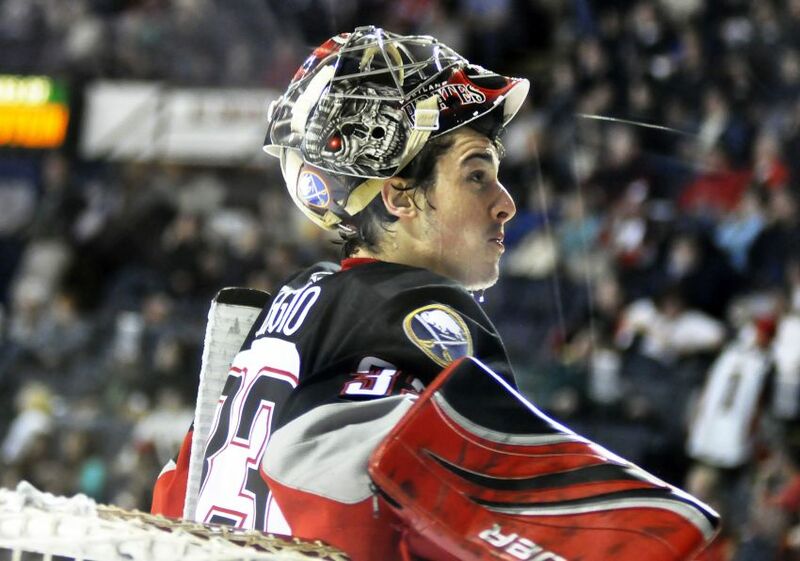 Opponents scored six or more goals on Leggio six times – a stunning 26 percent of his games – with Bridgeport. He was only pulled once. He said his inability to make some big saves early hurt him. After allowing seven goals March 1, the Isles traded Leggio to the Arizona Coyotes, who assigned him to the Portland Pirates. Back in Portland, where in 2010-11 he established himself as an AHL goalie under the Buffalo Sabres, he finished the season strongly with a 2.41 goals-against average and a .908 save percentage in five appearances. Dave’s a great guy, and a damn good goalie. He’s been helping my 16 year old son the last few years and its been a big help. He’s now playing 18uAAA and getting better. I hope Dave lands a deal this year. He deserves it. His clinics are worth every penny. Send your son.